WANDERERS are plotting a move for exciting Portuguese midfielder Joao Teixeira. The Bolton News understands talks are in an advanced stage to loan the 25-year-old from Sporting Braga. Teixeira is no stranger to English shores, having spent three years at Liverpool, which also included a highly-successful loan stint at Brighton in the Championship. Wanderers are looking to raise the bar on their recruitment this summer and advisor Lee Anderson jetted over to Faro recently to speak with Teixeira’s representatives. A product of the Sporting Lisbon youth system, Teixeira moved to Anfield in January 2012 for £1million and later won the club’s academy player of the year award. After a short loan spell at Brentford Teixeira made his first team bow for the Reds against Fulham, which led to a season-long loan at Brighton. The winger impressed at the Amex and won the club’s young player of the year prize, scoring six goals, but also suffered a broken leg in the final few weeks of the campaign. He did make a first start for Liverpool in the League Cup against Bournemouth and also scored his first goal for the Mersey men against Exeter City in the FA Cup. At the same time the midfielder agreed a loan move to Wanderers alongside Huddersfield Town’s Rajiv Van la Parra, only for the double loan move to collapse at the last moment when Neil Lennon was informed by the board there were no funds available to complete the deal. He moved to Porto for £250,000 compensation and was then loaned out to Braga, where he featured in the Europa League before making the move permanent for £1m. Wanderers are looking to bolster their squad with a couple of new signings closer to home by the weekend but the club are also casting their net into Europe. A move for Teixeira is understood to be the first of a couple of foreign-based deals which could come to fruition before the transfer deadline in August. That's a bit harsh Norpig. Of whom do you speak? Sorry but I don't think this one will happen. I suspect the lad has better options because I can see a number of high championship, maybe even low premiership clubs who could use him and we most likely won't be able to compete on the wages front. 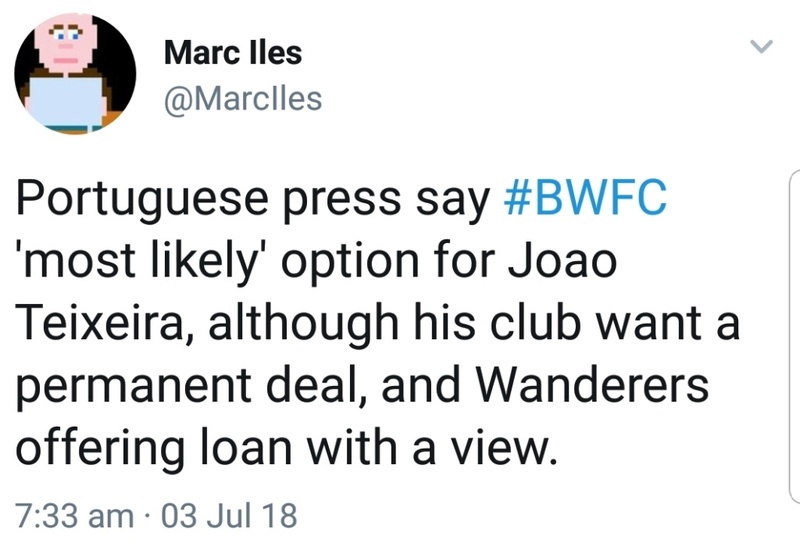 I'm not being negative, in fact I hope I'm wrong because from what I've seen this would be a really good move for us and if we can do a deal it's a no brainer imo. WANDERERS are believed to be in the driving seat to sign ex-Liverpool winger Joao Carlos Teixeira, with negotiations expected to pick up at the end of the week. Reports in the Portuguese press say the 25-year-old is considering a move back to England and that Bolton is looking the most likely destination – although Porto, the club who still hold his registration, are looking to manufacture a permanent transfer. Wanderers currently want to loan Teixeira, who has two years remaining on his contract, with a view to a permanent deal. Porto signed the midfielder in 2016 for 300,000 Euros but are willing to take less than half that fee to move him on this summer. Lee Anderson met with representatives of Gestifute, a company owned by Jorge Mendes, in Faro recently to discuss the possibility of a move and is hoping for further talks in a few days. Teixeira spent last season on loan with Braga and was pencilled in to return for another year until interest from Wanderers emerged. The midfielder knows he has little chance of returning to Sérgio Conceição’s Porto squad and is understood to be keen on a return to England, where he enjoyed the most prolific spell of his career on loan from Liverpool at Brighton.